As the name speaks We are located in traffic noise free area in a local neighbourhood called Paknajol (north side) but only 5 minutes away from the main tourist district of Thamel. The FPH offers clean, sunny, comfortable rooms from dormitory to single, double, Triple with en-suite or shared bathroom with hot and cold shower 24 hours. Our place is 15 minutes driving from airport 7 km and 15 minutes walking distance to Kathmandu Durbar square, 10 minutes to Narayanhity museum palace, 20 minutes to Monkey Temple and 5 minutes to Tourist bus stop. Overall our location is walking distance to city center, Thamel, restaurant, shops, travel agency and historical sites. A great roof top provides an excellent view of Monkey temple and city view as well as snowy white mountain in north. Beehive kitchen serves delicious food lunch, dinner and breakfast, hot and cold drinks too. For relaxing before or after you go out, we have many outdoor spaces where you can use our free Wi-Fi. We have a comfortable lounge area and the back garden or, if you prefer, you can enjoy our rooftop. If you are interested in practicing yoga our rooftop is the perfect place. Our dedicated team is committed to serve you better and make your stay happy, comfortable and enjoy. This is the 5th time that I have stayed at Family Peace House. 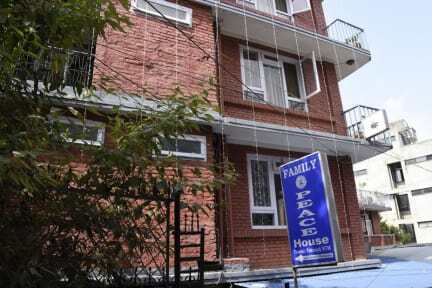 Great location away from the city noise and 3 minute walk to Thamel. Dal Bhat is very good and staff is like family. I really enjoy this place! After reading couple of bad reviews I had no idea what to expect but at the end it all went well. Nothing bad to say really. Good new painted clean rooms with lots of light. Great staff, good wifi and nice roof top and lot of seating area. Don't hesitate to stay. I really enjoyed my stay at Family Peace House! Even though it is tucked away off the main street, I find it central to every thing, its in a great location! Being tucked away means I could escape the hustle and bustle of the busy streets. Bimal and the staff are lovely and helpful. The rooms are nice and tidy. I would recommend to anyone staying in Kathmandu! Good hostel in prime location just outside from main Street, noise and traffic. Staff are awesome and welcoming. Owner is very helpful anytime with your questions. He gave us useful information on trek and surrounding. Just loved staying here and would recommend anyone who wants some quiet sleep and rest in busy Kathmandu. Free drinking water, toilet roll and good wifi is available which is good for budget travelers like me. Don't expect too much but if you are on budget trip Family peace house will be the best option. It's relatively clean, comfortable and safe place to stay near Thamel. I have stayed other places before and I like this place. It came cheaper than other places. It's such a relaxing place after busy days or trekking. Definiletly you will have some good sleep. Staff are friendly and helpful. Breakfast is good and served in roof top. They have nice common area where you can meet other people. We had a great stay here for our first few days in Kathmandu. The staff were really friendly and helpful, they helped us book our onward travel to Pokhara. 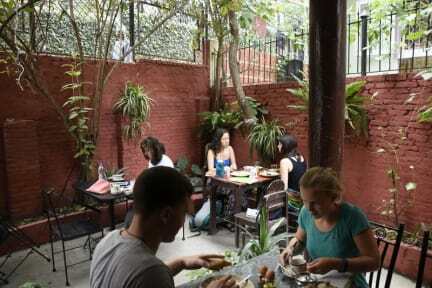 The location is great just outside Thamel (backpacker area) and easy to walk to main areas of the city. We are hoping to come back for a couple of nights at the end of the month. Excellent location, on the edge of Thamel so nice and quiet. All of the staff are friendly and happy to help you at any moment. You can leave you things here whenever you leave and come back. The vibe of the place is relaxed and mellow, and nice environment to chill. I don’t understand how this place has 8.2. We were shoved in a pop up cabin, it was dirty, it was cold, I didn’t feel safe, the communal showers and toilets were vile and no hot shower. I had originally booked a room in the house, I asked to be moved there for the remainder of our stay which they agreed but charged extra, that was equally unclean and everything smelt of rust in the mental bathroom! Location is perfect though, and why we stuck it out for a couple of nights.